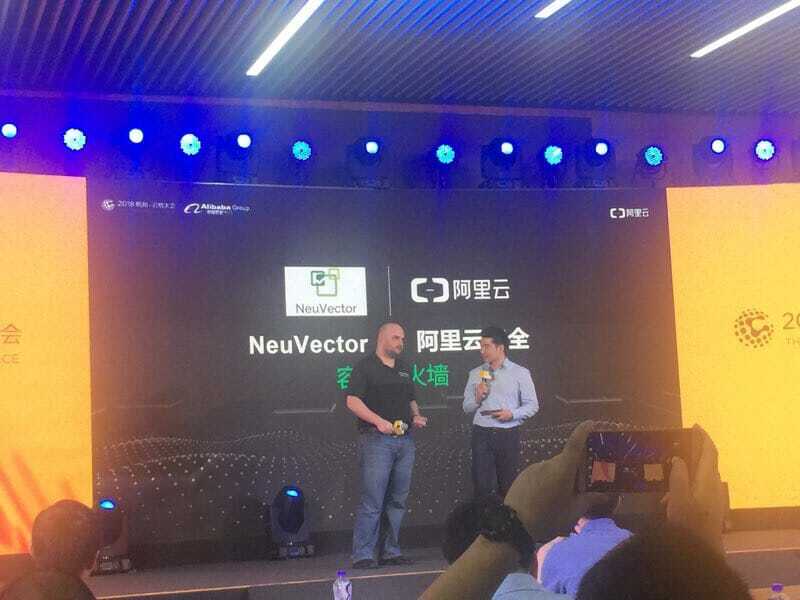 San Jose, CA – September 24, 2018 – NeuVector, the leader in Kubernetes security delivering the first and only multi-vector container firewall, and Alibaba Cloud, the cloud computing arm of Alibaba Group, today announced a new partnership to strengthen Kubernetes security for enterprise customers. Alibaba Cloud has recently launched its Container Service for Kubernetes to help users deploy containers more easily and securely, and the service is now utilizing NeuVector’s technology to provide specialized security for Kubernetes containers. Alibaba Cloud’s Container Service for Kubernetes is a fully-managed solution that enables organizations to focus on building their applications rather than constantly managing and optimizing container infrastructure. Importantly, the service provides high-performance, flexible, and enterprise-grade management of Kubernetes containerized applications throughout the entire application lifecycle. Container Service for Kubernetes simplifies cluster creation and expansion, and integrates Alibaba Cloud capabilities in virtualization, storage, network, and security to provide a markedly improved running environment for Kubernetes-containerized applications. Kubernetes container deployments can be threatened from both new attack vectors and traditional ones, leaving them particularly vulnerable to hackers, data theft, ransomware, crypto mining, and other dangers. To consistently protect against these attacks, the NeuVector container security platform adds the protection and visibility required for any business-critical, financial, web-facing, or compliance-driven deployment. Support throughout the entire DevOps container deployment lifecycle, from build to ship to run. Security automation, starting with a Jenkins plug-in for vulnerability scanning during the build process. Container registries such as the Alibaba Cloud Container Registry can be configured so that any new images in a repository will be automatically scanned by NeuVector. Kubernetes and Docker CIS benchmarks will test host and container configurations before and after production deployments. Run-time security is delivered by the unique, cloud-native Layer-7 container firewall that combines deep packet inspection (DPI) of east-west traffic with container inspection and host security to detect and prevent attacks at multiple points in the kill chain. Sign up for a free trial of Alibaba Cloud at https://www.alibabacloud.com/. For a free trial of the NeuVector container security platform, contact us at [email protected] or sign up at https://neuvector.com/try-neuvector/. NeuVector is the leader in Kubernetes security and delivers the first and only multi-vector container firewall – which enables the confident deployment of enterprise-wide container strategies across multi-cloud and on-prem environments. NeuVector provides east-west container traffic visibility, container protection, and host security in a highly integrated, automated security solution. Customers include global leaders in financial services, healthcare and publishing, and the company is partners with AWS, Docker, IBM, Rancher, Red Hat, and others. Founded by industry veterans from Fortinet, VMware, and Trend Micro, NeuVector has developed patent-pending behavioral learning for container security. Established in 2009, Alibaba Cloud, the cloud computing arm of Alibaba Group, is among the world’s top three IaaS providers according to Gartner, and the largest provider of public cloud services in China, according to IDC. Alibaba Cloud provides a comprehensive suite of cloud computing services to businesses worldwide, including merchants doing business on Alibaba Group marketplaces, start-ups, corporations and government organizations. Alibaba Cloud is the official Cloud Services Partner of the International Olympic Committee. Glen is VP Marketing & Product Management at NeuVector. Glen has over 20 years of experience in enterprise security, marketing SaaS, and infrastructure software. He has held executive management positions at Trend Micro, Provilla, Reactivity, Quantum and Rignite. NeuVector, the leader in Container Network Security, delivers highly integrated, automated security for Kubernetes and OpenShift, and is the only next generation container firewall with packet-level interrogation and enforcement.